Always loved the road. Nine days after college graduation I left Salem, Mass. with a book of traveler's checks, an atlas and a sleeping bag, and drove about 45,000 miles in 14 months. Saw southern Canada, northern Mexico and three dozen U.S. states. Kept a daily journal, recorded cassette messages and mailed 'em back to family and friends. When money ran low, at various times, I picked apples, worked as a tool peddler, and worked the graveyard shift at a Circle K convenience store. On the way back east, a loose slot belched gas money from Vegas to Knoxville. Always dreamed of reliving those days. Lately those dreams have been intensifying. Did you ever travel like that? Would love to hear your stories. We spent a few manic days and nights in Las Vegas this week as part of the Consumer Electronics Show (CES). I can never get over the amount of money it took to build some of these casinos. It's freakin' sinful. All the poverty and strife in the world... I don't even want to think about it. Then again, the Bellagio, the Wynn and the Venetian are absolutely gorgeous. The view from the outdoor cocktail lounge atop the Rio is spectacular. The cabs are expensive -- even more so than New York -- but the cabbies are friendly and helpful. Come to think of it, I don't think I've ever seen a Vegas cabbie wearing a turban. I once had a female cabbie who had recently arrived from Russia. She was fun to talk to -- talking about the old Soviet days. But she was white and pretty. I wouldn't be a bit surprised if the shadowy powers that run Vegas don't want blacks or Arabs driving people around on the Strip. God forbid: that might make them uncomfortable and want to flee the city with no clocks, no reality and no shame. Traveling soon? The TSA (which stands for Take Stuff Away) has announced new restrictions regarding lithium ion batteries. Video crews flying to Las Vegas next week to cover CES, take note. Most laptop-toting travelers will remain unaffected. Hat tip to Paul Kedrosky. There's an organization out there that helps the vagabonds among us find a place to stay for free, for a night or two or maybe longer. It's called CouchSurfing.com. As a host, it seems like a great way to meet someone new and interesting. As a traveler, it's definitely a great way to save money. Amicalola Falls, in Amicalola State Park in Georgia, was under stress when we saw it today. Normally, you can't get too close to the falls because the spray will drench you. Today, because of the extreme drought here, there was no spray whatsoever. In fact, instead of the water cascading over the rocks in a single sheet as it usually does, the depleted flow emerged over the rocks in a series of four weak streams. The folks here in this state are praying for lots of rain, and they should be. He may have lived in nearby Mount Vernon, but George Washington sure did love to spend time in Alexandria, Va., where we're staying tonight. Back when he made his living as a surveyor, Washington planned the layout of most of the roads in town. During the Revolutionary War and during his Presidency, he never forgot his homies back in Alexandria. In retirement he maintained a second residence there. 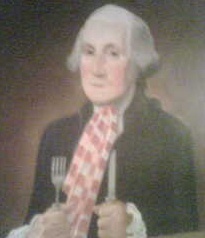 In fact, Washington celebrated his 66th and 67th birthdays with wife Martha down the street from his Alexandria town house at Gadsby's Tavern, which to this day is a restaurant and a museum. This dopey painting hangs in the restaurant, over the staircase on the way to the rest rooms. Here's the Wikipedia entry on the guy. He was really something. Tags: Alexandria, George Washington, Mount Vernon, Va. It's probably no surprise that Greenwich Village was crazy on the Saturday night before Halloween. Hundreds of costumed young people roamed the streets. Christy and I were there to see David Sanborn at the Blue Note. Now 62, Sanborn is best known as the guy who played sax on David Bowie's "Young Americans," but he's a lot more versatile than that, as we learned last night. Quite a show. We also learned that it's not easy to find a cab in the Village at 3:30 A.M. The clubs begin to close and all the revelers stagger to the street at the same time with their arms flailing about. Most cabs display their "off duty" signs but they will stop if they're in the mood. We got lucky and hailed one near New York University, where we found ourselves sharing the sidewalks with rats and dope peddlers. Christy asked the cabbie whether it's tough to find a good tipper at that hour. "That's not the big problem," the cabbie said. "The big problem is finding someone who isn't going to sit back there and throw up in your cab." Today it's off to New York City for four days, then to Washington D.C., Atlanta and back to Beverly, MA before zipping down to Providence, R.I. for a Dweezil Zappa concert a week from tomorrow night. Planes, trains and automobiles. Hope to have some good stories for you. We spent the weekend at Calaveras Big Trees State Park, near Arnold, Calif. As we did back in June, we saw spectacular giant sequoias and redwoods, only this time surrounded by poplars and dogwoods in brilliant fall colors. No, we didn't see any mountain lions, but they're on the prowl up there, especially at dawn and dusk. The park rangers are asking visitors to report the wildlife they see in the park, and mountain lions are at the top of their list. We chanced to meet a ranger whose cat was eaten by a mountain lion this summer. "They're still on the endangered list, but at this point they really should be taken off," he said. We're headed back to Oakland today after four days in Seattle, where we visited SWMS subscribers and had a lot of fun on the side. The air is so oxygenated here! Unlike nearly everywhere else, it actually rains in this part of the US. Not too much this time, though... equal parts showers, drizzle and sunshine. We stayed at a bed & breakfast in the Capitol Hill area, brimming with ethnic restaurants, costume shops and panhandlers. Five cats lived in the used bookstore we visited. It was fun to have a newborn kitten on my lap while flipping the pages.